The cottages are set in woodlands and gardens with magnificent views over Bantry Bay. The Estate has its own pebble beach. The Beara, Sheeps head and Mizen peninsulas are all within an easy drive. 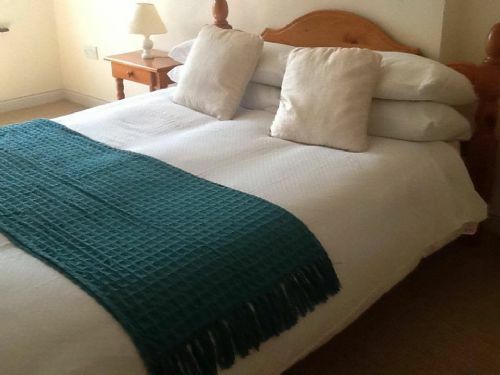 Guests at Ardnagashel are spoilt for choice with excellent local restaurants, shops, pubs and craft centres and for those seeking outdoor activity, there are a wide range of amenities on the doorstep. Wide arrange of amenities on the doorstep. One small pet welcome a charge of €20 is payable on arrival. Situated 8 km from Cork City, this historic castle is most famous for its stone, it is said it has the traditional power of conferring eloquence on all who kiss it. The stone is set in the wall below the battlements, and to kiss it, one has to lean backwards (grasping an iron railing) from the parapet walk. In the grounds of the castle the Rock Close and its surroundings is a curious place of ancient trees and far more ancient stones, by legend a garden of druidic origin and a centre of worship in pre-Christian days. The place has an aura of magic and mystique with Wishing Steps, Witch's Kitchen, Druids Cave and many other delights such as Lake Walk, Waterfall, Fern Garden, Ice-house and Lime Kiln, all telling a story of centuries past. Three souvenir shops, Bureau de Change, refreshments, restored stable yard and old farm machinery, Blarney Lake and wildlife, arboretum and gardens, garden walk and woodland walks. Sundays- Summers 9am to 5.30pm and winters 9am to sundown. Voted one of the top ten attractions in Ireland. At Fota wildlife park you get to walk amongst the animals from all over the world. A fun day out for all the family, learn about the animals and their habitats. You can take a guided tour or stroll around the grounds at your own pace. There are lots to see and do here. There are two cafes which sell hot and cold meals and refreshments. Ice-cream boots are dotted around the grounds. There are play area for kids and a lovely gift shop. Sunday 10..30 am last entry at 5.00pm and gates close at 6.00 pm. Originally a medieval fishing port, historic Kinsale is one of the most picturesque, popular and historic towns on the south west coast of Ireland. It has been hailed as the Gourmet Capital of Ireland, with no shortage of cafes, pubs and restaurants to suit every taste and budget. It is just 18 miles from Cork city. Why not visit Kinsale and take a tour of this lovely town. There are many activities’ to choose from for everyone in the family. Try whale watching, scuba diving, sailing, kayaking, fishing, or horse riding. Visit Charles Fort or maybe the International Museum of Wine. There is so much to discover and do in this beautiful little town. Two of Cork City's leading tourist attractions are housed in this amazing building, found just a stroll away from Cork city centre and the famous Shandon church bells. Situated in the former Governor’s House, the Radio Museum Experience incorporates the restored 6CK Radio Broadcasting Studio. There is an audio-visual presentation on Marconi, particularly his Irish connections, and a wonderfully nostalgic collection of artefacts from the early days of radio, including the RTE Collection. They use audio visual technology to bring the story to life using cinematic shows, scene sets, holographic imagery and touch screen technology. It is a must see if you go to Cork. Open 7 days a week 9am – 6 pm with last admission at 5 pm. The traditional Irish music session is the quintessential “Irish experience” and has rightly earned its place on the “must dos” when visiting Ireland. Duck into a pub any evening and chances are a small group of musicians will have taken over a corner.